This is the dam to Wrights Griz 49. 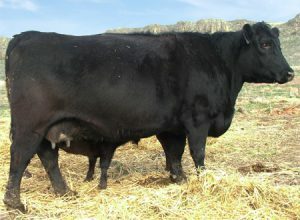 She has done a tremendous job of producing bull calves that we are very proud to be able to offer to the angus industry. She is very easy fleshing, long bodied and a very nice udder. The cross between her and our herd sire has proven to be a great combination. This is the grand dam to Wrights Griz 49. 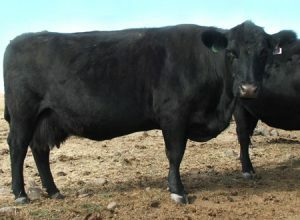 She has been a great cow to help us build our registered herd. She has the length, thickness and milk production we look for in a cow. In a past year she raised a set of twin heifers that weaned off at over 1300 pounds total.